Allow me to lay a couple of cards on the table before I begin my rant! The farthest I competed in sports while in school was eight grade football. The reason for that is when I hit high school, I was too small and most of all too scared. Plus I have big ears and every time I took off that dam helmet it hurt like hell! So yeah, a part of me wants to succeed in sports through my nine-year old kid, a bigger part of me that Id like to admit, but its the truth. Also I am not some crazed lunatic coaching my daughter from the sidelines, and getting kicked out of games and stuff. However, what if I was? When did parents exactly lose the right to raise their kid during sports? 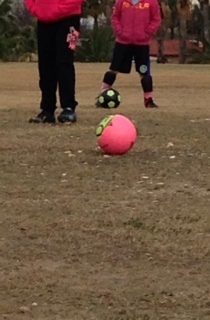 This is her third year playing and yeah I would love a scholarship in her soccer future, and whats so wrong with that? Whats wrong with teaching my kid the value of being a winner, that not everyone gets a trophy. Most of all, and the real reason I’m upset, is that I hate that I feel so awkward when I yell to my daughter to “follow the ball!” after she kicks it. I can feel the eyes of the surrounding “SOCCER POLICE” stare me down! Whats wrong with a little aggression? I literally only yelled twice at her hour long practice and I felt like I had a big “A” strapped on my back! I’m not sure when I lost the right to raise my third child the way my wife and I feel fit, but I just hate the fact that everyone in her soccer league is now so dam sensitive. Me as Dad, is now only allowed to whisper to my kid, “Great game baby,” and hope nobody gets offended.